Belimo safety actuators for fire protection and smoke control dampers help save lives and protect property in case of fires. People in industrialized countries spend a good 90 percent of their time in buildings. And where people live and work, protecting life is the first priority. An important factor here is safety in case of fire. Reaction time is crucial in order to prevent the spread of fire and smoke at an early stage and to keep escape and rescue routes smoke-free for as long as possible: the faster the reaction in the event of a fire, the lower the damage to human lives, property and the environment. Fire protection in buildings is based on three main pillars: structural, technical and organizational fire protection. Technical fire protection is more important than ever, especially in modern buildings with unusual designs, mixed use or increasing building complexity and size. Belimo addressed this topic very early on, especially with regard to technical fire protection. As far back as 1978 – three years after its foundation – Belimo sold actuators that could be mounted on fire dampers. 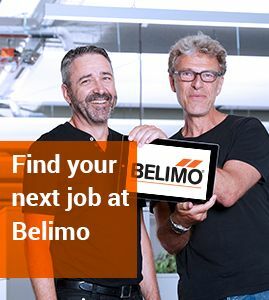 In the meantime, Belimo has become the world market leader in the motorization of fire and smoke control dampers with well-founded expertise and experience. 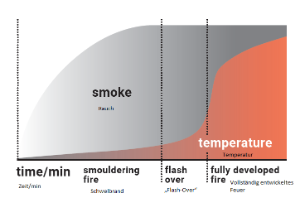 Compared to mechanical fire dampers, which close only at high temperatures, motorized dampers have a major advantage: in case of fire, they can be closed early – triggered, by example by a smoke detector signal. This reliably and promptly prevents the spread of fire and smoke in the building. In addition, the motorization enables regular functional checks of the fire dampers, which further increases safety in the building. Belimo offers original equipment manufacturers (OEMs) of fire and smoke control dampers a comprehensive range of actuators specifically developed for their applications. We use the latest technologies and the highest standards when it comes to development, material procurement, production and final testing. Together with the dampers, the actuators must comply with international and national safety standards, which include life cycle and fire tests among others. Between 2015 and 2018, Belimo introduced a new range of fire damper actuators in Europe. These have a unique, patented locking function (Safety Position Lock™) which keeps the dampers securely closed in case of fire. The customer reaction to this expansion of the product range was positive. 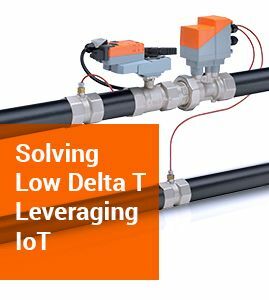 A new generation of smoke control actuators has been developed, the market launch of which is planned for 2019. As well as enabling Belimo to expand its market position further in the fire protection sector, it will also make a decisive contribution to saving human lives. Increasing urbanization is leading to compacted construction, with greater height and depth on a small surface area. Buildings of this type, which are typically high-rise, require new technical solutions that enable safe evacuation and support fire-fighting measures by the fire department. 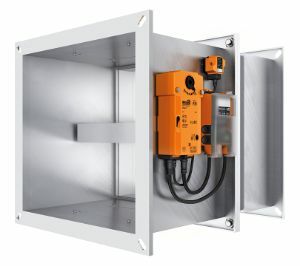 Smoke control pressure differential systems ensure smoke-free escape and rescue routes – especially in stairwells or fire-fighting lifts – and are becoming increasingly important. They enable the creation of what is known as a safety stair, thereby removing the need for a second stairwell. Without having to compromise on safety, this area can be used for other purposes, thereby reducing construction costs. Because of the market potential in the application of smoke exclusion, Belimo invested in a test and demonstration plant at its headquarters in 2018. This smoke control pressure differential system is unique in its design. 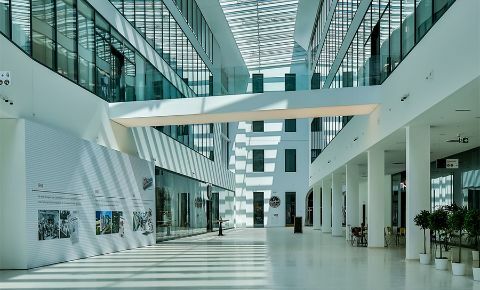 Architectural bureau Halle 1 | Location Linz (Austria) | Project type mixed use Offices, apartments, hotel, event hall, underground car park | Site area 12 000 m² (129 000 ft²) | Useable area 57 600 m² (620 000 ft², incl. under ground car park) | Office building 1 900 m² (20 500 ft²) | Hotel 129 bedrooms. 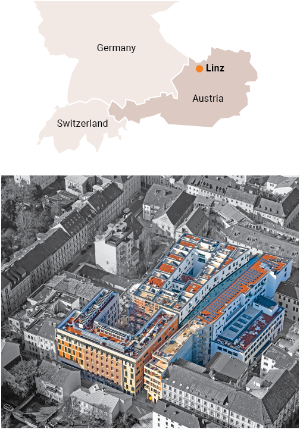 With its safety solutions, Belimo is making a significant contribution to the reliable fire protection of a “special” building in Linz. In the heart of Linz (Austria) – at the edge of where the Linz city fortifications once stood, now stand the Promenaden Galerien – a modern building that links the cityʼs pedestrianized zones amid its historic buildings, providing space for shops, restaurants, offices, rental apartments, an event hall and a hotel. The building complex has been owned by Wimmer Medien since 1885. Until 2003, it housed the printing presses for the Oberösterreichische Nachrichten newspaper. They were dismantled in 2008 – the starting signal for the promenade concept, which began in April 2010. The Cuturi family, owners of Wimmer Medien, had big plans for the Promenaden Galerien. They wanted to create a very special place: “A place that appears upmarket without appearing detached that brings joy to its visitors,” explains Paolo Cuturi, project manager of the Promenaden Galerien. He was thus able to fulfil his father Rudolf Andreas Cuturiʼs lifelong dream – a dream that finally had its ceremonial opening in June 2018. A highly professional team was needed to make such a special place possible. The Cuturi family called in renowned specialists to realize their vision of the Promenaden Galerien at an early stage. The Salzburg architectural bureau Halle 1 managed to combine the old and the new to create a state-of-the-art unit. For example, a new walkway has been created with an urban flair where people like to stop to linger and spend their time. Where printing presses once clattered, today pulsates with life. And where people work, safety must be a top priority. Therefore right from the outset, fire protection was a central issue when planning the building. 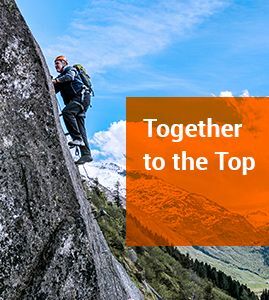 In terms of fire protection, Austria is one of the most advanced countries in the world. In addition to European standards and directives, country-specific fire protection standards must also be observed, some of which place even higher demands on technical systems. For buildings in which a fire alarm system is installed, motorized fire dampers are mandatory in Austria. The operators of the Promenaden Galerien even went one step further: “The fire damper actuators have to close the dampers in the evening as soon as the ventilation system is switched off,” says Norbert Kaimberger, project manager and authorized signatory of the electrical installation company ETECH. “This reliably prevents the spread of smoke and fire through the ventilation system.” At the same time, the regular closing and opening of the fire dampers is logged as a function test, which makes a decisive contribution to the safety of the building. For the Promenaden Galerien project, six Linz companies had joined forces under the leadership of ETECH as a joint venture for the entire technical building installation. In addition to the electrical installation work, their area of responsibility also included implementing cross-discipline networking and control technology. Comfortable room climate, efficient operation of the building technology and the required fire protection quality could thus be ensured. Very early on in the project, special attention was also paid to optimal interaction between the various sections. Depending on the aspect, different specialist groups deal with fire protection. Early coordination is therefore of the utmost importance in order to guarantee a high-quality solution for fire protection and, in particular, smoke extraction. For the same reason, what is referred to as an integral test was carried out during the initial acceptance of the safety-related systems. This ensures that the cross-system functions are fulfilled in accordance with the fire protection concept and that the safety targets are achieved in case of fire. The fire protection concept of a building describes the safety targets in order to be able to guarantee the safety of people and property. Since the greatest danger to people in the event of fire is from intense buildup of smoke, additional smoke extraction devices are usually installed in buildings such as the Promenaden Galerien to ensure smoke-free escape and rescue routes. The systems are automatically activated as soon as the fire alarm system detects smoke. At the same time, the fire department is also alerted. three each in the underground car park and in the restaurant and shopping area. “We selected a central, intelligent monitoring and control system to control and monitor a total of 40 motorized smoke control dampers and six smoke extraction fans,” adds Mr. Kaimberger. 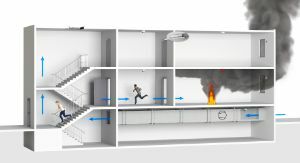 The system automatically performs and logs regular operational checks of all motorized fire and smoke control dampers connected. In case of any alterations, such as a change in use of rooms, it allows the security scenarios to be adapted in a simple and flexible procedure. In addition, the central system supports maintenance and servicing of the systems. Fire protection is also a top priority in the three-storey underground car park of the Promenaden Galerien. A vehicle fire in an underground car park can quickly cause air temperatures of up to 700 degrees Celsius. These can lead to the statics of the reinforced concrete being weakened and consequently damage the entire building structure. In addition, the dense, toxic smoke poses a considerable risk to human lives. For all these reasons, effective fire protection systems are indispensable in underground car parks in order to react early when smoke first develops. Securing smoke-free escape and rescue routes is also of utmost importance in underground car parks. A sprinkler system in conjunction with an efficient smoke control system guarantees that the required safety targets can be achieved in the Promenaden Galerien.